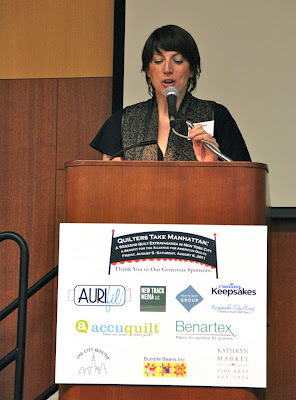 As promised, there was a second event day of the Alliance for American Quilts. I wanted to bring a few more photos depicting some of the wonderful happening that day. 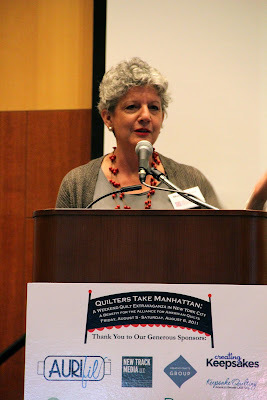 Marianne Fons was one of the keynote speakers and she gave an incredible lecture. It was a pleasure meeting her especially since I have been watching her show since I started quilting some 18 years ago. Her daughter, Mary, was also one of the speakers and presented quite a comedic lecture. For those of you who would like to get to know her more, she has an internet show called Quilty. Then many of the gals from the Alliance were able to model some very beautiful creations of Jay McCarroll's. Don't they all look gorgeous? Mark Lipinski interviewed Jay for his Quilter's SOS and his touchstone piece was modeled by Luke Haynes another Alliance Board Member. There were also all kinds of goodies that were being bid on in the silent auction. This little box of buttons, beads, and embellishments was one that I got to go home with, very excited!! Then it was off to The City Quilter for cocktails and more fun. These little quilts were made by Alliance board members and were also being bid on in a silent auction. The one in the upper right corner is Victoria's. Very cute!! I really love this one! Here you can see Victoria with the piece that she won. Luke's self portrait. Doe you see the resemblance? Here is the piece that I won from the beautiful France Holliday Alford. I just love it all embellished and totally my color scheme. Hmmm... wait my dress matches! Thanks Frances! I couldn't leave you without a picture of me and my friend, Marie Bostwick. We just had waaaaayyyy too much fun! Love ya, Marie! Oh, doesn't she look great in chiffon? Of course, I couldn't leave you without this photo. 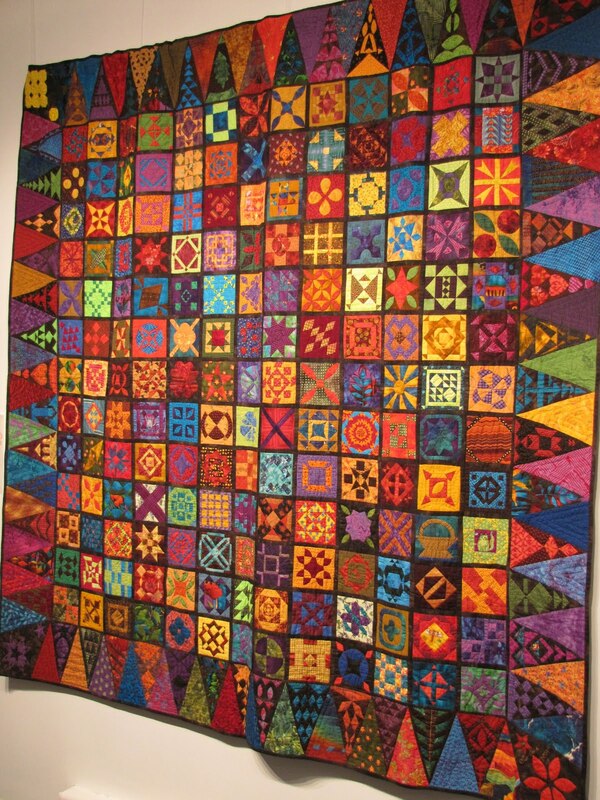 For all you Dear Jane lovers, this was hanging in The City Quilter's gallery. Just love the brights! It was a fun filled two days, but wait I stayed through until Sunday! Come back tomorrow to see what I did!